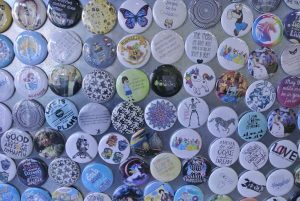 Buttons and Magnets are a great way to personalize your style. Above all, you want your personality to shine through when you accessorize. Buttons first, give you the flexibility and secondly, are fun to mix and match up. Come by our store to look through our huge selection of buttons or look below on more information about making custom button orders with your own images.